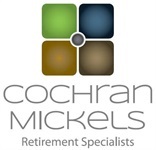 Whether you are ready to retire soon, thinking ahead, or creating your own unique options, CochranMickels can help you discover how to get there with confidence. You have saved in many places and may receive retirement income from a number of sources. We can help you learn ways to most effectively use these assets and income to help you achieve the retirement lifestyle you desire, a tailored solution to meet your needs – and feel confident that the decisions you're making today will help achieve your dreams tomorrow. Our planning is a process of discovery and understanding in which our clients become engaged and energized. We work together to look at the what-ifs and develop promising opportunities, and provide direction for your future. Our plans are fluid so that they are easily adjusted when your life changes. When it comes to investing, there's no such thing as a "one size fits all" solution. We believe there is no one product or solution that will meet every person's needs. And, investment advice goes beyond giving buy/sell recommendations and executing transactions. Good advice is in your highest financial interest, no matter what. We offer solutions and not products that best mitigate your risk management needs. Whether its financial/retirement planning or wealth management, all of our solutions are handcrafted to fit our client's best interests.